Proper posture is a habit that we were all lectured on early in our lives, but it can easily be overlooked as we grow because it’s a gradual thing that we don’t notice at first. Poor posture can lead to many general health problems, including back and neck pain, which can lead to other secondary problems like fatigue, depression, or sedentary lifestyles. Posture braces assist in preventing slouching in your upper torso and shoulders by providing support. Other braces can assist in lower back posture as well. If you’re suffering from poor posture and you’re looking for a brace to correct it, then there are a few things to look for. The type of brace should be appropriate to the type of correction you require. The construction quality, size, and material of the brace are important so it has a proper, comfortable fit. If you intend on wearing it out, then being able to conceal it underneath clothing will be important as well. If you’re suffering from chronic back pain as a result of slumping posture, then this lower back brace by NMT will be right for you. It can handle up to 42 inches waistline with its 100% latex and chemical free construction. This back brace will help you free up your movement, and re-align your posture in a short period of time. It touts self-healing capabilities, which penetrate into the root cause of your problems with its unique Magnetic Natural Therapy. 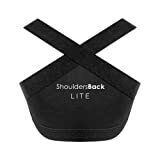 This extra large clavicle support by FLA Orthopedics is suitable for fractures, sprains or even just improving shoulder posture. It has a simple, form-fitting design, with just a ring, and two straps that wrap around the front of your shoulders/arms. The extra soft padding takes away moisture and is comfortable to wear around the clock. The support works by pulling back shoulders to align the clavicle and relieves pressure on your spine. The Body Rite Posture Pleaser is simple and effective at relieving back pain and improving posture. It features one size fits all design with comfortable, easily adjustable shoulder straps. By pulling back the shoulders and bracing the back with a counterbalance, it straightens out your posture, which prevents muscle strain in your neck, shoulders, and arms. Oppo Medical’s posture brace is suitable for aiding in the recovery of collarbone fractures and round shoulder issues. It will steadily improve your posture over time by aligning your joints and bones. This X-Large brace will fit snug for the upper chest circumference of 35 1/8 – 41 1/8 inches. The elastic material makes it easy for non-restrictive, natural movement throughout the day. The EquiFit by Gaiam is comfortable and good at improving back posture in a short amount of time. It uses adjustable Velcro straps to increase or decrease the amount of compression. 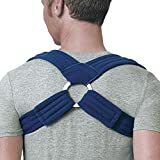 Unlike many other corrective braces that are designed for the upper back, this one wraps entirely around your upper back area instead of just having cross-straps. This gives it full compression capabilities that can help retrain your posture in as little as one hour a day. 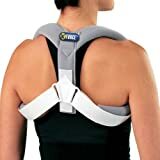 If you’re looking for a more versatile fitting brace, then this 2 in 1 posture brace by Posturific Brace is recommended. Depending on what type of correction/maintenance you require, you can either wear it upright across your collarbone or flatter around the side of your shoulders. The latter is suitable if you have moderate to severe mid back curve, while the former is if you have a slight mid back curve. It improves your posture by wearing it just 30 minutes a day. This comes in extra small, small, medium, large, and extra large sizes. The XForce correct brace is good for relieving pain that results from poor posture. The brace wraps around your shoulders and straightens out your posture to help prevent neck, back, and shoulder pain. It features a latex-free breathable material that is comfortable to wear. The shoulder straps are padded with a soft foam that prevents distress while you move around. On the bottom is an adjustable buckle closure to prevent slippage with the strap. This is an affordable option if you are often sitting around a computer or desk during the day.